My first round of research in my classroom involved assessing my students ability to evaluate digital media for credibility. I did this by giving students a pretest and a post test with a Google Form. The test consisted of questions ranging from students rating their own abilities to evaluate digital media, to having students rate a variety of websites for their credibility. Students also listed methods that they currently used for evaluating digital media. After students took the pretest, I provided a hyperdoc lesson for students to complete during the course of one week. The final task of the hyperdoc was for students to create an infographic demonstrating what they had learned. I concluded the unit with a post test with the same questions as the pretest. The results of the pretest can be seen on the infographic displayed to the right. The results from the pretest demonstrated that students had received some prior instruction on how to evaluate websites for credibility, specifically students repeatedly reported that they knew to check the URL of the page and that a .gov URL was a trustworthy site. ​Students increased their score between the pre and post test. Results can be seen in the graph below. Students self rating of their ability to evaluate websites for credibility. Their scores increased from the pretest to the post test. Results between the pre and post test can be seen in the graph below. The video to the left is a summary of my research conducted in my classroom regarding my students ability to evaluate digital media. Click the document below to read my IRB proposal for my research study. 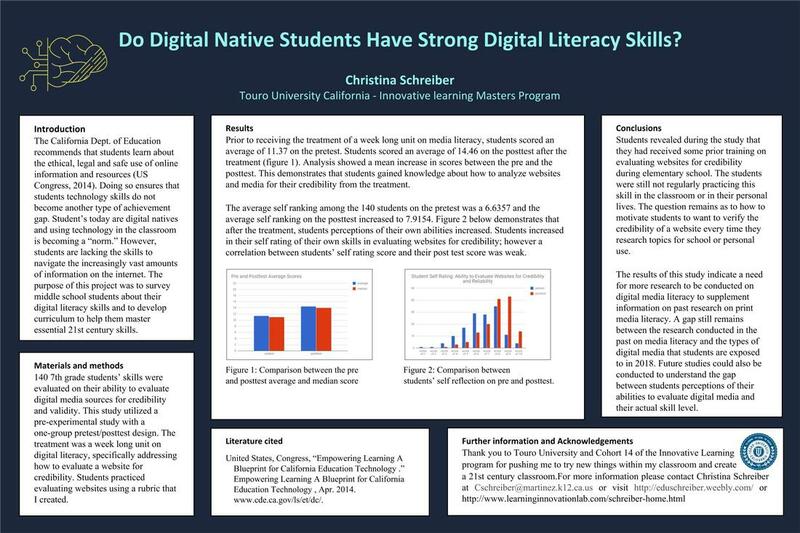 Click the document below to read my research paper on students digital literacy skills.